I've just come to hospital to do my work on a nice Sunday afternoon in November. Suddenly I've heard noise. No, the kindergarten wasn't having a festivity. 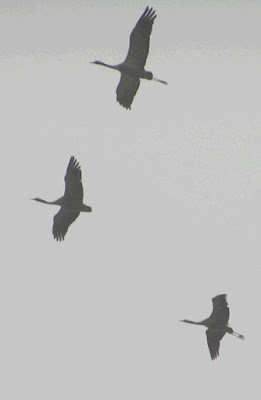 I've heard thousands of cranes (not wild geese) cattering as they were crossing the hospital and Meerbusch to the Southwest. Here are some of the pictures, I've been able to take a couple of minutes ago. I had to correct this post as cranes were passing the hospital. It must have been a couple of thousands of birds flying in formation and in waves first across the hospital and then a little further to the South. Today I've found by chance some other pictures, I've taken a couple of years ago. I'm not sure if these are legally called health claims; anyway that would be the duty of the FDA to decide. Theses claims, however, warrant a closer look at the ingredients. There’s turmeric/curcumin in Fibrolief. Sorry, no study on PubMed – search has been done with this strategy: ("Curcuma"[Mesh] OR "Curcumin"[Mesh] OR "curcuminoid synthase, Curcuma longa" [Supplementary Concept] OR "turmeric extract" [Supplementary Concept]) AND "Fibromyalgia"[Mesh]. As fibromyalgia isn’t an inflammatory disease, why should turmeric work? “Boswellia is a popular herb used for its benefits in fighting inflammation.” It doesn’t even work in arthritis. And so sorry, nothing on PubMed, too. “White Willow Bark extract contains the active ingredient salicin which is a Cox-1 and Cox-2 inhibitor, and acts as an anti-inflammatory and also reduces pain by inhibiting prostaglandins.” That’s true, but … NSAIDs work like a key, which has to be but on a slot, the enzyme Cox-a or Cox-2. No matter whether you take salicin, aspirin or any other NSAID, you need the same number of key to lock the enzymes. Salicin is more toxic like aspirin, which is more toxic than naproxen, Diclofenac, ibuprofen or Cox-2-inhibitors. Salicin doesn’t work in fibromyalgia, which isn’t surprising as NSAIDs generally aren’t of much use in fibromyalgia. Please look here: http://www.ncbi.nlm.nih.gov/pubmed/19746561. One could cite a plethora of studies that proved the inefficacy of NSAIDs in fibromyalgia pain. “Celery seed extract has been used as a pain reliever for arthritis, fibromyalgia and gout. It is known to help reduce muscle spasms and to alleviate painful gas and bloating. It is also known to aid in improving the painful symptoms of fibromyalgia sufferers by reducing inflammation.” How could symptoms of fibromyalgia be alleviated by reducing inflammation? And you guessed right, there’s no study on PubMed addressing fibromyalgia and celery seed extract. There has indeed be a study in 1995. IJ Russell and colleagues published: “Treatment of fibromyalgia syndrome with Super Malic: a randomized, double blind, placebo controlled, crossover pilot study.” The study had been done in 24 patients, which is quite low. In results we are informed: “No clear treatment effect attributable to Super Malic was seen in the blinded, fixed low dose trial.” Conclusions: “These data suggest that Super Malic is safe and may be beneficial in the treatment of patients with FM. Future placebo-controlled studies should utilize up to 6 tablets of Super Malic bid and continue therapy for at least 2 months.” There have no further studies and may be is wishful thinking. The results didn’t show an effect. No study on rhodiola rosea and fibromyalgia. There is a study in mice on nociceptive pain: “Synergistic interactions between the antinociceptive effect of Rhodiola rosea extract and B vitamins in the mouse formalin test.” But pain in fibromyalgia is non-nociceptive! “Coenzyme Q10 (CoQ10) A powerful Antioxidant”. There are studies going on, but in the last decade only small studies (N=5) or other pilot studies have been published. I don’t think that there’s the foundation for a breakthrough, but waiting for the result, especially for the dosing is a good idea. Nothing on fibromyalgia and bacopa monnieri. “SAM-e is made from amino acid methionine and ATP. Studies have shown its effective for arthritis pain and shows both analgesic and anti-inflammatory properties.” I’ve already written about the futility of using SAM-e in fibromyalgia n this blog: http://rheumatologe.blogspot.de/2014/08/sam-e-and-fibromyalgia.html. There is a deficiency in the general public. Eat a banana! There also is a deficiency in the general public in vitamin D3. But in the US you already have lots of D3 fortified foods. And most people live 10° South of for instance Germany. Four times 3000 IU vitamin D3 per day might be an overdose. Nothing on fibromyalgia and alpha lipoic acid on PubMed. There has been a Turkish study in 2008 seeing low levels of zinc in fibromyalgia patients, but there’s no study showing that substitution of zinc improves fibromyalgia. Nothing on fibromyalgia and black pepper bioperine on PubMed. The ingredients of Fibrolief aren’t convincing in reducing fibromyalgia symptoms. And Fibrolief is a dietary supplement, which hasn’t to show efficacy like a drug. But the producers should be careful with health claims. As you would spend around 750 US $ per year on Fibrolief, you should be pretty sure that it works. I would feel better with a scientific study on the effects of this product, but there is none. Would I buy Fibrolief? Nope! I was a bit surprised to read about Leining, a novel cytotoxic T-lymphocyte antigen-4 fusion protein in patients with rheumatoid arthritis. W. Fan and colleagues just published: “A randomized, double-blind, and placebo-controlled multicenter clinical trial of a novel cytotoxic T-lymphocyte antigen-4 fusion protein, Leining, in Chinese active rheumatoid arthritis patients with an inadequate response to methotrexate.” Conclusions: “Leining demonstrated clinically meaningful efficacy compared with placebo in Chinese patients with active RA despite MTX therapy. Administration of Leining in combination with MTX for 24 weeks was well tolerated.” Link: http://www.ncbi.nlm.nih.gov/pubmed/24671501. There had been an article in Acta Pharmacologica Sinica in 2009: “Pharmacokinetics of CTLA4Ig fusion protein in healthy volunteers and patients with rheumatoid arthritis” by Y. Ma and colleagues – a phase 1 study! Conclusions: “Intravenous infusion of CTLA4Ig was well tolerated in healthy volunteers and patients with rheumatoid arthritis. CTLA4Ig exhibited linear pharmacokinetics over the dose range of 1 to 20 mg/kg in healthy volunteers. The pharmacokinetics in RA patients appeared to be similar to that in healthy volunteers. No system accumulation appeared upon repeated infusions of 10 mg/kg every 4 weeks.” Link: http://www.nature.com/aps/journal/v30/n3/abs/aps200913a.html. Leining looks like a biosimilar to abatacept (Orencia) to me. In abatacept the extracellular domain of CTLA-4 and the Fc region of the immunoglobulin IgG1 are fused together. As I couldn’t find anything on it, I’ve contacted W. Fan and colleagues to tell us, whether Leining is a biosimilar to abatacept or what else it is. Since a visit to Guangzhou (广州), where I've watched the steady come and go of newly weds with their photographer from sitting at a Starbucks sipping at my coffee, I am interested in the phenomenon. And I've seen people taking white wedding photographs all over the world. Doesn't this happy woman make your day? Needless to say I looked out, when and where couples were to be seen. Oh, Turkmenistan. I nearly forgot Turkmenistan. It's forbidden in Turkmenistan to take photographs of weddings, at least tourists aren't allowed to take pictures. Besides the streets of Ashgabat are as empty as a ghost town. But already in Khiva, the first town I've visited in Uzbekistan, I could see, that white weddings are en vogue in Uzbekistan. Then it took a while until I chanced upon a white wedding, but I saw a couple in Tashkent, who was nice enough to let me take the photograph: it had been pitch dark and the flash wasn't as good as needed, I have to admit. In Kyrgyzstan couples go to Freedom Square (commemorating World War II) to place some flowers at the monument have their pictures taken. You will notice that also the white wedding is established in the Muslim world, at least in Central Asia. Central Asia has all the modern forms of transport and I'll also show some of these, but even more interesting are the more traditional form that have survived there. In the West we'll might have to use these again in a few decades. You can see all kind of trucks, ultra modern and some that had already seen better days. And the kind of tractor, you need a traktorist for. That's a truck in the Kyzyl Kum - good Tyres! On several occasions I could see trains. I shouldn’t have taken pictures, but here are some. The metros of Tashkent and Almaty resemble the metros in Kiew, Pyongyang and of course Moscow. In Tashkent it's forbidden to take pictures in the underground. In Almaty one cannot take pictures of the ticket (better token) booth, but the young women in there looked like in the song "Lovely Rita" by the The Beatles. I thought it strange that they have to wear uniform to sell tokens. Almaty also has a tram service. Bishkek and Almaty have trolleys. Donkey carts and horse carts are heavily in use in rural areas. There are some means of transportation, that shouldn't be omitted. Stretch limos are in use!